Gen-pak is a solution that enables users to use neural machine translation more securely available via Google Translation API. Although it is said to be difficult to unify terms when using neural machine translation, our proprietary technology makes it possible to apply glossaries. Also, Word, PowerPoint, and Excel files can be translated while keeping formatting. Machine translation to date has consisted mainly of rule-based machine translation that translates based on registered rules, and statistical machine translation that registers a large amount of bilingual data (called a “corpus”) and generates translated sentences by statistical methods. But, in 2016, Google announced its Neural Machine Translation (NMT) engine based on deep learning. The dramatic improvement in the quality of machine translation has attracted a lot of attention, and the utilization of NMT is expected to improve work efficiency in practical translation. TOIN has been conducting an empirical investigation on improving productivity also, and last year, we announced our results at the MT Summit (International Conference on Machine Translation). The key to business success is how to effectively and safely use the NMT engine in the future. Even though many customers want to use the latest NMT engines, there are also many customers who hesitate to use them in their business because they are concerned about information leaks. Gen-pak makes it possible to use machine translation more securely while ensuring data security by translating via the Google Translation API. One difficulty that Neural MT has, is that, despite producing very fluent translations, the use of terms it uses in translation are not always uniformly consistent. For example, the same word may be output to translate different words in the translation within the same sentence. TOIN solves this problem using T-term. 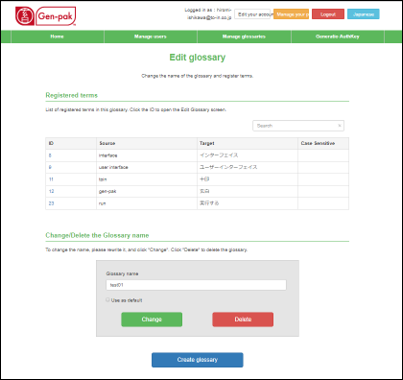 T-term makes it possible to uniformly translate words by applying the glossary specified by the user. We provide an interface that is intuitive to operate, even for those who are using it for the first time. Furthermore, users can obtain a translated file simply by dragging various files. We plan to rollout support for PDF format file translation and then e-mail translation. □ Translate exchanges of internal emails, etc. This solution is suitable for those who want to understand the gist of foreign-language content quickly, but do not necessarily need a fully accurate translation. We offer two versions of this solution depending on the customer’s needs, a cloud version in which you can access the system running on our hosted server over the Internet, and an on-premise version offering a customer-dedicated server. We offer a trial period of 30 days (number of translated characters: up to 20,000 letters) before you officially apply, so you can apply after confirming actual usability (please do not hesitate to contact us at, mkt@to-in.co.jp, if you would like a trial).